Keyring crafted in stainless steel. VOYAGE - Ingenious design from Georg Jensen brings tranquillity to the stress of travel. UK designer Michael Young’s international career means he’s always travelling. He shares the ‘airport panic’ all men recognise: that uncertain feeling which comes with having to keep passport, tickets, boarding pass and immigration papers all in one secure and convenient place. His stainless steel and black ABS passport holder brings tranquillity to travel by keeping everything to hand – in one hand! Its sleek design has space for all the necessary documents, plus room for a pen, as well credit cards, so there’s no need to also juggle a wallet. The passport holder forms part of Young’s travel accessory concept called VOYAGE. It is accompanied by a key-ring, which is also the result of the designer’s quest for an elegant and functional solution to a perennial problem. Its arresting looks, in stainless steel with a robust black PUR rubber strap, complement its practicality. Key-fumbling, another curse of the tired or hassled traveller, is eliminated. Each key is held separately, so you can identify them at a glance. Lost luggage is perhaps the major cause of travel stress. The third travel accessory in the VOYAGE concept is the all-important luggage tag. 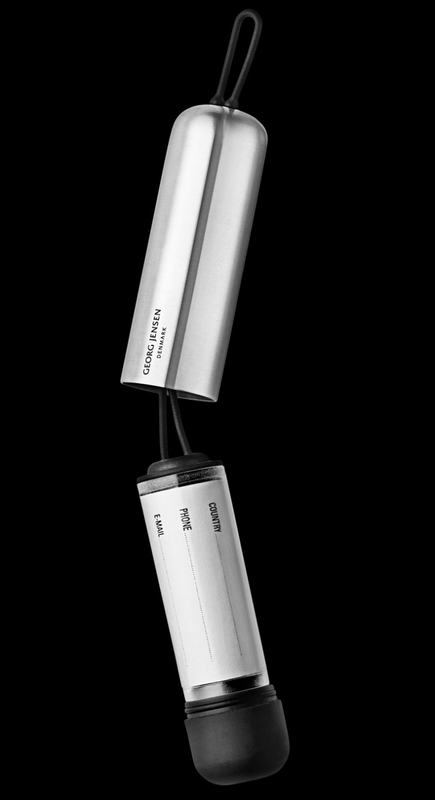 Smart thinking, ease of use and elegance are all combined in its stainless steel design. The black polycarbonate cap screws securely in place the metal tube that holds the name and address tag. 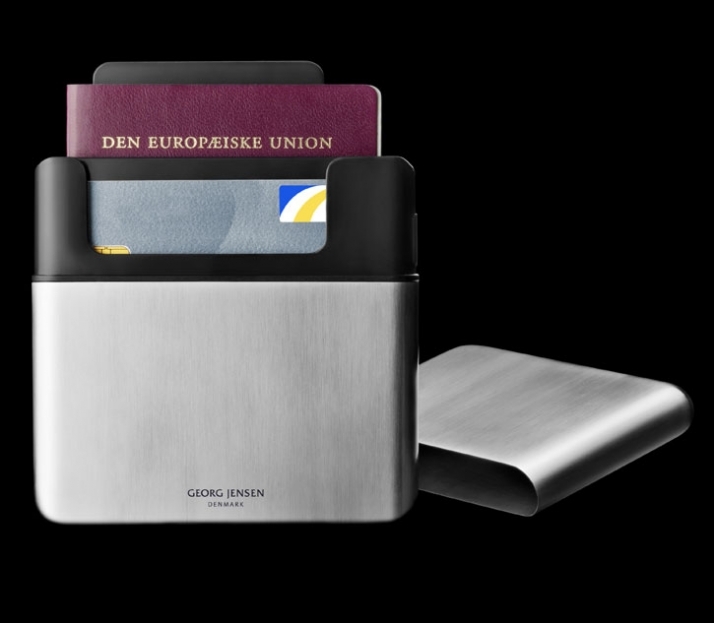 The VOYAGE travel accessories connect directly to Georg Jensen’s bold and innovative approach to design. These three contemporary solutions to traditional design challenges are sold individually. Luggage tag crafted in stainless steel, acrylic and rubber. LIVING is the product area in the Georg Jensen portfolio that focuses on exclusive designs for home and office. Georg Jensen, founded in Denmark in 1904, began as a silversmith’s workshop creating exclusive silver jewellery, flatware and hollowware. Millions of people all over the world are drawn to the purity and elegance of Nordic design, and Georg Jensen is recognised as one of Denmark’s best-known and best loved brands. UK-born Michael Young is one of the most influential designers of his generation. Kortrijk Design Biennale Director Max Borka says “one can not underestimate the dramatic influence his work has had on design”. Since 1992, his works have been collected by the Centre Pompidou, the Louvre, Die Neue Sammlung Museum and London’s Design Museum. His clients have included Galley Kreo, Danese, Artemide, Rosenthal & Swedese and Icelandic nightclub Astro Bar. He recently presented new works for Established & Sons in Milan alongside such luminaries as Zaha Hadid and Future Systems. Since creating a studio in Hong Kong, he has embarked on a range of branding and design projects, including a City Storm bike for Giant, a barware range for Schweppes and bottles for Asahi.